Please check compatibility in the description section. Please read the listing carefully as variants can be common. 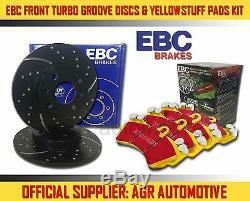 EBC FRONT GD DISCS YELLOWSTUFF PADS 280mm FOR NISSAN PRIMERA 1.8 (P11) 1999-02. Part Number : FR:GD969(DP41238R)(3257). YELLOWSTUFF: Ultra High Friction Pads for Race, Trackday and Street Use. These pads do not require warm up but do get even stronger under the heat of hard driving. These are not a low dust pad and if your desire is for a low dust premium street use pad, you should consider EBC Redstuff. When considering full race use, Yellowstuff has been a strong favourite, having been used for two years in the Swedish Camaro Cup and at numerous other race events where a stock caliper system is fitted. It is also the choice of 90% of the Mazda MX5 Miata competitors in the UK race series and has an unblemished record as rotor friendly track pad for vehicles up to 3500 lbs or 1600 kilos weight or 200 BHP. In the USA the SCCA and NASA drivershave been testing Yellowstuff with feedback and good reports POURING in from a 543 test driver major market proving event with these groups. Read that figure again 543 test drivers. There is no guesswork here. Because of its huge heat range , the applications where EBC Yellowstuff will deliver benefits range from fastest street use on higher horsepower sedans to Trackday and Race use on most street based cars and even as a brake upgrade on Trucks and SUV. Yellowstuff is especially appreciated on Trucks for towing and heavy loads and where wheel and tire oversize upgrades have been fitted. EBC Brakes GD Rotors are made from high quality grey iron to exacting standards and undergo extensive testing and rigorous quality control and are then precision machined to your chosen slot or dimple pattern. The Discs come coated in either the colour Gold or Black, but this will come off with pad use to reveal the original iron cast underneath. The dimple drilled rotor was invented by EBC back in the 90s and has been imitated by many because of its ability to offer pad degassing without Through Drilling disc or rotor holes which has been shown to promote rotor cracks. The wide aperture slots on the EBC units actually draw cool air under the brake pad and rotor interface and help cool the temperatures of the pad contact which can shoot up to well over 1000 degrees at the very heart of the brake pad during heavy braking and can cause brake fade or loss of brake effect. These Full sweep slots on the EBC Sport Brake rotor also help remove dirt dust debris and water from the braking area but without doubt the main benefit of such sport rotors is their ability to maintain a flat and parallel pad surface throughout the lifetime of the brake pad set. EBC manufacture 90% of its rotor range in ISO and TUV approved facilities in the UK or in Italy, all rotors including GD Sport Rotors are machined and finished in the UK and in the USA. Where castings or finished rotors have been bought in to complement the range, the strictest quality controls you can imagine ensure the safety and quality of the parts we sell. EBC adds value to its products by strictest quality controls and specifications and a 100% run out and dimensional check. Picture A - Generic Image Picture B - Brake Pads Diagram Picture C - Brake Discs Technical Drawing. We will do our best to answer as fast as possible. Be aware that your Model of Vehicle may have a choice of 2 / 3 different FRONT DISCS AND PADS Options. Such variations can apply due to upgrade designs on later chassis numbers, or the manufacturers using different OEM suppliers during production process. We will do our best to assist and narrow down the variations. In some cases you may have to physically check your current fitted FRONT DISCS AND PADS to the picture diagram and part number provided. Boxes must be opened carefully, and not torn open. Please see the item detail page for confirmation. This also applies to all orders going to the Scottish Highlands, Northern Ireland, or other offshore UK islands. For European deliveries will go with DHL, UPS or DPD Express service. Anything outside of Europe will go by Air Express. Our post is collected every weekday (Monday-Friday excluding Bank Holidays and exceptional circumstances) from our warehouse in Manchester. Please note that if you have not received your order in the expected time frame, we have to contact courier company before a lost in post claim form can be put through - however this is a very rare occurrence and something we do not see happen often. If you need your order urgently then we suggest using Next Day service. After informing us of the return, you have 15 days from that date to have the part delivered back to us. We do not take liability for the safe return of unwanted or faulty goods. Then at our discretion we will decide the next course of action. The item "EBC FRONT GD DISCS YELLOWSTUFF PADS 280mm FOR NISSAN PRIMERA 1.8 (P11) 1999-02" is in sale since Wednesday, March 16, 2016. This item is in the category "Vehicle Parts & Accessories\Car Parts\Brakes & Brake Parts\Brake Component Packages". The seller is "agrauto" and is located in Huddersfield.